A neatly dressed toddler ran down the hallway of the Catholic Charities Spanish Catholic Center towards the open-armed Dr. Deirdre Byrne. The joyous embrace embodies Byrne’s dual roles, so does the monogram on her surgical smock: “Sr. Dr. Dede.” Byrne, who prefers the title of Sr. Dede, is both a member of a religious order, the Little Workers of the Sacred Heart, and a medical surgeon. On this morning, she was trailed by Dr. Paul Melluzzo, her surgical consultant, who spoke to the parents of the young child with the help of a Spanish translator. It was a beautiful and inspiring scene, but a routine occurrence for this dynamic duo of surgeons. Byrne has served as a volunteer surgeon at the Spanish Catholic Center for 18 years and Melluzzo for 12 years as a volunteer surgical consultant, caring for the migrant community that comes through their door. “Many of the people we care for are the working poor that slip through the cracks,” said Byrne. She described being astonished by the work ethic of one patient who went back to working in a truck days after a hernia operation. Melluzzo is also impressed by his patients. “I don’t think you will find a more grateful group – the patients,” he said. Patients are often surprised they can afford health care at the center. Byrne spoke of one patient who broke into tears after hearing the bill for an operation would be $400. Earlier in the week, another doctor told her the medical bill could be $10,000. Byrne and Melluzzo care about their work at the Spanish Catholic Center and are proud of it. They also acknowledge the challenges that come with providing medical service to underserved patients in the Washington, D.C. area. Yet the challenges have strengthened their partnership and rapport. During a joint interview, they joked like brother and sister as they discussed the difficulties of the job and supported the other in their own way. Byrne, while discussing lack of resources, would poke sibling-sorts of jokes at Melluzzo’s steep decline in pay, as she sips her diet orange soda laughing. Melluzzo – a bit more reserved – would mention the minor miracle nature of operations they are able to perform through Sibley Hospital after Byrne touched on the difficulties brought on by changes in management and health care over the years. Shenanigans and steady support aside, they are there to serve their patients and do it well. Another driving force behind Byrne and Melluzzo’s work is their past military service. Byrne, one of eight children, went to Georgetown Medical School in 1978 on an Army scholarship. She served in the military as an Army Reservist from 1982 to 2016. Indeed, for many years, Byrne was a sister, soldier, and surgeon. “To help our soldiers was a great experience, I thank God for that,” said Byrne. “It is a gift to be on the healing and prayerful end of the war.” As an Army Reservist, she served at Walter Reed Medical Center, Fort Carson, and Afghanistan. Byrne’s missionary work as a surgeon has also taken her to Iraq, Haiti, Kenya, and Sudan. It was Byrne’s missionary and Army service that brought Melluzzo to the Spanish Catholic Center. With Byrne serving in Sudan three months at a time, it was Melluzzo who came onto the team and kept the surgical care going at the Spanish Catholic Center. There was no break in service because Melluzzo would conduct surgical consultation and line up operations for when Byrne returned. “Those were the days when I could go operate my heart out in Sudan and come back to twenty gallbladders waiting for me,” Byrne explained. 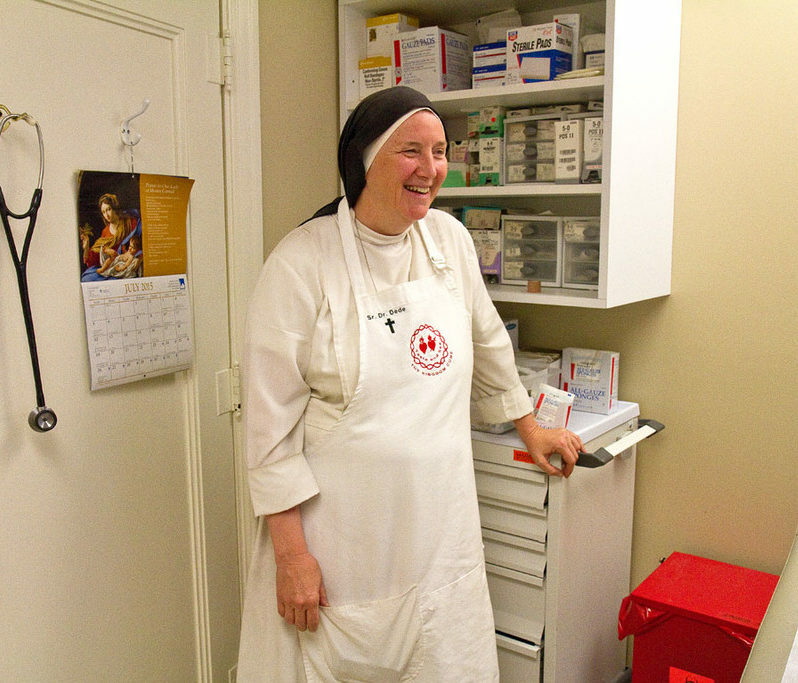 Click here to learn more about the Catholic Charities Medical Clinics. This article was written by Luke Garrett, 2018 Catholic Charities Summer Intern.